Sony's new game rental service, "Playstation Now," has recently sent out additional invites to members of the PlayStation community. PlayStation Now adds the ability to stream games from your PS3 console and play them on other sony devices. So, let's say you want to play The Last of Us on PS4, now you can with the power of streaming. Sony recently reported that more invites to the service have been sent out to the community and multiple other sources reported finding beta invites in their email boxes last Thursday. The PlayStation Now service was first revealed at CES in January. This service will initially stream PS3 games to PlayStation consoles, however, Sony said that more games from different platforms will follow in the future. You can also stream these games on your Sony Bravia TVs and in the future, you will even be able to stream games on other Sony and non-Sony devices. The Playstation Now beta is only going on in the United states for the time being. Sony said that PS Now will be available in the U.S. sometime during this coming summer. However, users in Europe won't be able to get this feature until 2015. With the new PS Now subscription, you will have the ability to rent individual games or you can access the whole game library. However, the service will not be free, as it will be an extra subscription. 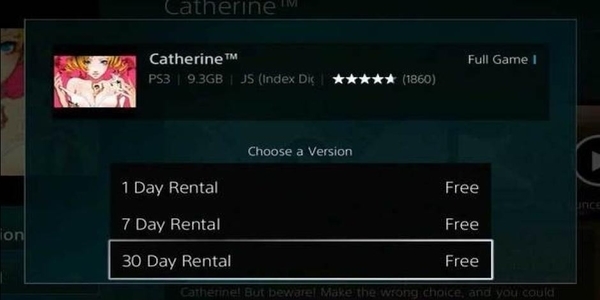 Upon renting a game, you will have the option to determine how long you would like to rent the game for. The renting of a game comes in increments of either one, seven, or 30 days at a time (image above). There is no word on if this will be a part of the PlayStation Plus service or something separate, but you can most likely expect it as a separate service. Although PlayStation Now was first revealed in January, this active service was first spotted in the middle of March on the United States PlayStation store. As far as connection goes, Sony recommends that users of this service should have at least a 5mb connection to be able to handle the streaming, which makes sense considering the scale of the content that will be streamed. PS Now will supposedly arrive to users in the United States sometime over the summer of 2014 and will supposedly arrive for European users within the first quarter of 2015.